Thank you to everyone that has sent in their photos last year. We received hundreds of photos from 25 different people. We've added 70 of the best ones to our Facebook page for you to vote on. View the Photos Now! Please vote for your favorite photos by Liking and Sharing them. Winners will receive entry fees or Boatride gear. You may Like as many photos as you want. You may also tag people in the photos if you know who they are. Voting ends on Wednesday Mar 8. The amount of Likes represents 60% of the voting process. The other 40% is from the vote of the Waupaca Boatride panel. Registration is now open for the grass portion of the 2019 Waupaca Boatride/US Open Grass Volleyball Tournament. The event will be held at Brighton Acres, The Bar of Oshkosh and Rev's Bowl Bar & Grill in Oshkosh, Wisconsin on July 12-14, 2019. Sand Registration: We have some big news brewing for the sand tournaments. Details and registration coming soon. 2019 change: We have split the Reverse Coed Quads on Sunday into Power and Pure divisions. In Power Reverse, guys can hit from behind a 10' line. In Pure Reverse, guys can't hit. The Waupaca Boatride Volleyball Tournament is always scheduled around the second Saturday of July. The dates for 2019 are July 12-14. Tournament registration will open in February 2019. Due to the rain Friday, we will be moving the start time to 10:30am Saturday morning for all triples divisions. Please, Please, Please consolidate vehicles, as parking space is limited. You can use the local park-and-rides and the large parking lot at The Outlet Shoppes at Oshkosh on the frontage road. Checkin location will be inside Brighton Acres and some court assignments may have changed so please double check. Court side tent space can't be guaranteed. Please be patient as we expect some delays. Thank you for understanding, see you soon. Pass the word! - Please remember that check in for triples begins on Friday July 13 at 5:00pm and Saturday July 14 at 6:30am. - Changes/additions since Monday 07/09/18 are not reflected in the Pools document . - Your Pool or Court Number may change. Look at the Pool Play Boards when you check-in. Its also possible that no-shows may affect what court you are playing on. - Above Pool Assignments are for Friday Coed Quads and Grass Doubles, Saturday Triples and Sunday Reverse Quad and Grass Coed Doubles. Pools for Juniors Quads, Juniors Sand Doubles and all Sand Doubles will be announced the day of. -Women's Open Sand Doubles will start play at The Bar and finish at Brighton Acres. The same sand is in play at both locations for Women's Open. -Men's Open Triples change from last year: 2 teams from each pool will move up and 2 teams will move down following Pool Play. We've added Coed Grass Doubles on Sunday July 15 as an alternative to Coed Sand Doubles. The Coed Sand Doubles is limited to 4 sand courts, and has been full for a month, while there's no limit to the number of grass courts we can have. The same rules apply in the grass as in the sand except let serves are not legal, there are no antennas and the courts are full size. We also recommend those waiting to get into the Friday sand tournaments to consider Men's and Women's Grass Doubles on Friday as an alternative. -Women's Open Quarterfinals and beyond will be held at Brighton Acres. We will evaluate these caps at the end of June and see if we need to adjust them any further. Open Divisions: If you don't have a history of playing in our Open divisions or other pro or open tournaments, you do not qualify for these Open Sand tournaments. We need to be strict with this because space is so limited. The tournament directors will reject or move teams if necessary. Men: due to the popularity of this division we are making all interested teams register for the waitlist so we can approve qualified teams as they come in. 1st Place: Viet Nguyen's Setting the Moon. 2nd Place: Karen Chin's Final Cheers. Thank you to everyone that sent us photos and to all those that voted. Even if your photos didn't win the contest, we could possibly use them in this year's marketing materials, for which you would be credited. View all of the contest photos here. Camping registration for the 2018 Waupaca Boatride Volleyball Tournament is now open. Camping is a cheap alternative to hotels as it's one flat price for the whole weekend versus a per night rate. 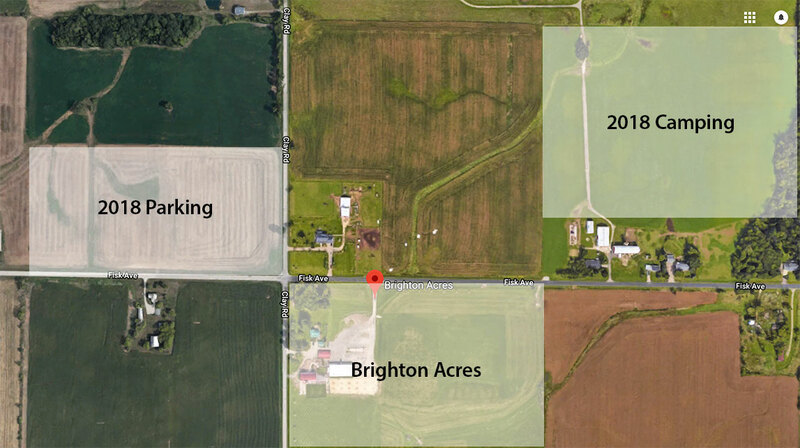 The campground is located right across the street from Brighton Acres and all of the festivities. There are three types of campsites that you can register for: a 20x40 foot regular site ($65 for the weekend), a 20x40 foot family/quiet site ($65 for the weekend) and a 40x40 foot RV/double site ($115 for the weekend). We have secured a block of rooms at the Holiday Inn Fond du Lac. The hotel is 17 miles from the grounds. Call 920-923-1440 and mention Waupaca Boatride Volleyball Tournament for a special rate. Thank you to everyone that has sent in their photos last year. We received hundreds of photos from 25 different people. We've added over 70 of the best ones to our Facebook page for you to vote on. View the Photos Now! Please vote for your favorite photos by Liking and Sharing them. Winners will receive entry fees or Boatride gear. You may Like as many photos as you want. You may also tag people in the photos if you know who they are. Voting ends on Wednesday Mar 23. The amount of Likes represents 60% of the voting process. The other 40% is from the vote of the Waupaca Boatride panel. Camping registration is going to be delayed until later in May. We are in the process of moving the campgrounds to a new property this year and the late snow storm has set us back a bit. We will make an announcement as soon as we open registration. Registration is now open for the 2018 Waupaca Boatride/US Open Grass Volleyball Tournament. The event will be held at Brighton Acres, The Bar of Oshkosh and Rev's Bowl Bar & Grill in Oshkosh, Wisconsin on July 13-15, 2018. 2018 change: We have brought back Men's & Women's Grass Doubles on Friday. We don't have enough sand courts to meet demand, so grass is the alternative. 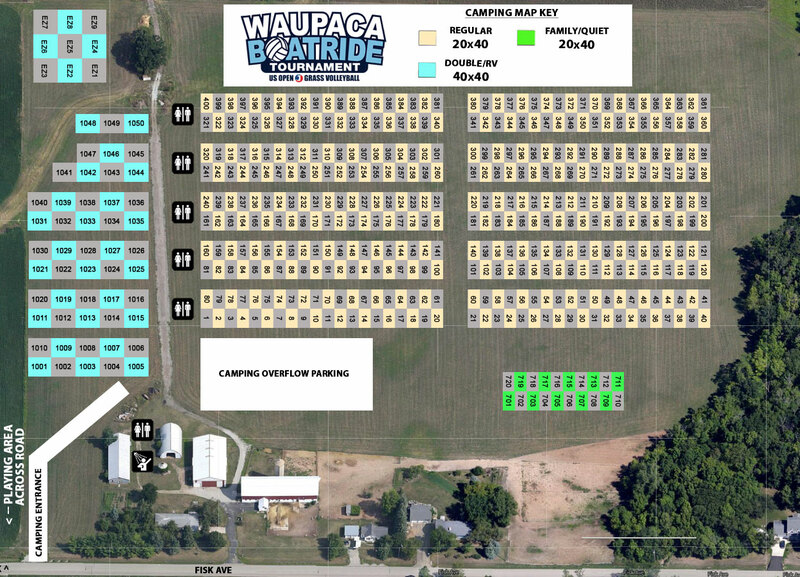 We have received a lot of emails asking when the next Waupaca Boatride is. For those wondering, we are always scheduled around the second Saturday of July. The dates for 2018 are July 13-15. Oshkosh will be host to both Lifefest and Rock USA on that same weekend, so hotel space will be extremely limited. You will want to book your hotels ASAP if that's the route you prefer for lodging. We're officially taking submissions for the photo contest. Some of the photos we've already seen are amazing, so send them to us by the end of the month and we'll post our favorites to Facebook and have a contest. The Grand prize is a free entry to next year's event, and if we use your photos for our 2018 marketing materials, we will make sure to give you credit. 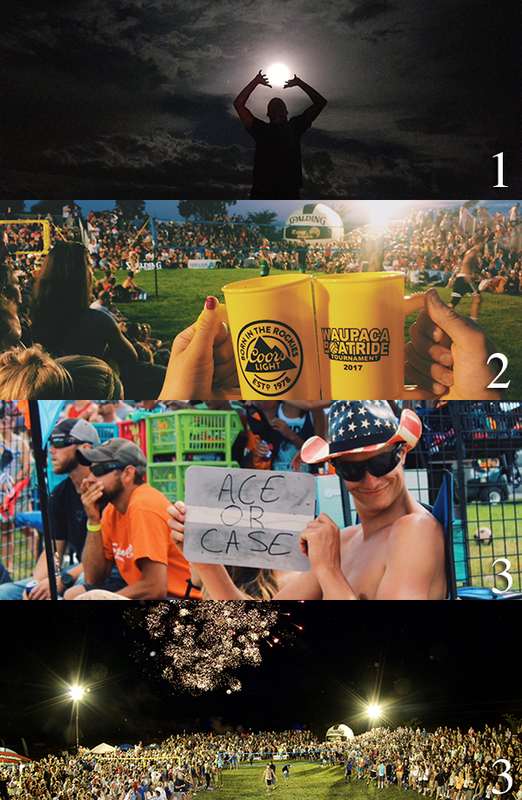 For more details on how to submit your photos, please email eddie@waupacaboatride.com. Over $40K in Cash and Prizes! Subscribe to our newsletter for tournament news and updates. "Had a great time this year at the Waupaca Boatride Volleyball Tournament. You guys do an excellent job. Thanks for another fun weekend!" - Sara P. "This was the 1st year that I played in the Waupaca Boatride. I think it is a very well organized event and would recommend it to all volleyball players. Over-all, great job with the volleyball tournament." - Brian H. "The Waupaca Boatride Volleyball Tournament always draws my interest because we get to play against teams we've never seen before. This is a great change of pace and a chance to test our skills with a broader base of players."